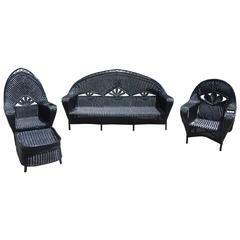 Antique Ficks Reed wicker set in fresh black paint. 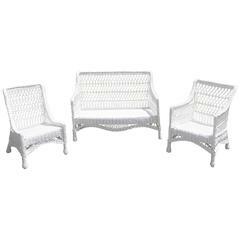 Sofa, chair and rocker in closely woven pattern with open lattice work under the arms. Pieces are fully skirted for tailored look on all sides. Sofa measures 71" wide, 30" tall, 32" deep, seat height 13", seat depth 23". Chair measures 29" wide, 39" tall, 34" deep, seat height 12.5". Rocker measures 29" wide, 36.5" tall, 36" deep, seat height 13".